Black Friday is upon us! To celebrate, we’ve picked out 5 new menswear stunners from our latest collection. All featured items fit our core criteria — comfortable, stylish, affordable, and well-constructed. Use our offer code BLKFRI17 at online checkout to get 10% off all of this fantastic clothing. Gabicci celebrate their 35th anniversary with a limited edition range of retro knitwear. 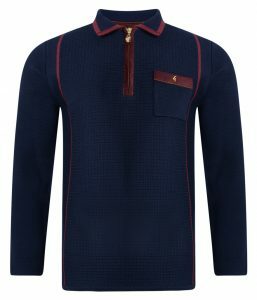 We’re bowled over by this classic knitted polo, boasting an unorthodox “open weave” that harks back to retro 70s styles. There are so many other features to admire, not least the easy-to-open half zip with a burgundy suede placket. There’s a cool chest pocket — also suede lined with the classic gold ‘G’ — plus a retro polo collar. Gabicci have put out similar versions in Black and Port, all limited edition specials for their big 35th birthday bash. 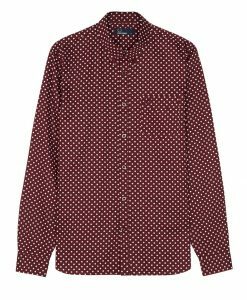 We love a Polka dot pattern here at Apache, and this early release SS18 season shirt by Fred Perry is a classic of the genre. Available in Mahogany (pictured) and Medieval Blue, this classic button-down is made with textured woven self diamond cotton for an extra touch of quality and comfort. Button cuffs, a chest pocket and classic tonal Fred Perry embroidered logo round off what is a very dapper heritage shirt, ideal for parties, Christmas events or a cheeky night out. Now we’re getting super-classy. Guide London is one of our favourite smart casual brands, putting out a stunning range of shirts, coats and jackets. 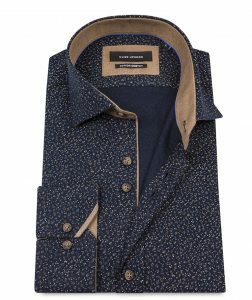 This dazzling “Ditsy” shirt works wonders with a small palate of dark colours, with an all-over micro print pattern and milky-brown trimming under the cut-away collar, cuffs and placket. For even more sharpness, Guide have thrown in a mitred cuff and used a special cotton stretch fabric for better comfort and flexibility. Wear this beauty on a night out or Christmas party, and we guarantee you’ll be the envy of the place! 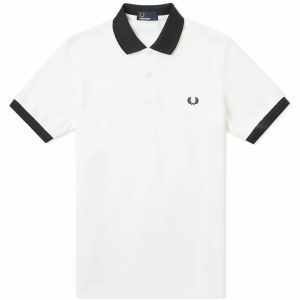 Bearing a close resemblance to our immensely popular M3600 polo shirt, this new arrival from Fred Perry makes the most of a classic formula. What makes it unique is the self-coloured twin tipping on the cuff and collar — look closely and you’ll see. Choose from two versions — Snow White (pictured) and Mahogany — both Spring Summer 2018 early releases. As always, Fred uses 100% Pique cotton for the perfect polo feel. As soon as we laid eyes on this tweed-style Jacquard sweatshirt by Farah, we knew it would go down a storm. The vintage design is simple and striking, confirming our view that Farah do the basics as well as anyone. The sweat features a contrast crew neck, welt and cuffs, and a loopback cotton interior to prevent “pilling” against a T shirt. Use the code BLKFRI17 before Monday to claim our Black Friday 10% discount! 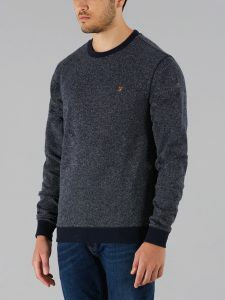 NextBlack Friday Menswear Deals on 2018 Early Releases!